Published in the North Island Gazette October 14/15. As October storms wreak their fury on the coast, some may remember the story of one particularly fierce storm almost a hundred years ago, that took the lives of 40 people in the only sinking of a Canadian naval vessel during the Great War. Her Majesty's Canadian Ship (HMCS) Galiano, was built in 1913 in Ireland as a Fisheries Service vessel. It was a sister ship to the HMCS Malaspina. She was 162.3 feet in length with a beam of 27.1 feet. After sailing around Cape Horn to arrive in Victoria the Galiano had only a short life in the Fisheries Service before the ship and its crew were re-assigned to the Canadian Navy and Naval Reserves when the war broke out in 1914. 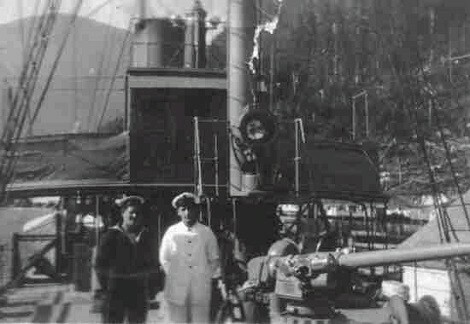 The Galiano was not supposed to be north of Vancouver Island that October evening in 1918, but the Malaspina was in need of repairs and was confined to the dock at Esquimalt, so the Galiano was tasked to bring much needed supplies in to the lighthouse and wireless station at Triangle Island. The station was apparently running dangerously low on fuel. As the ship was taking on coal in Ladysmith a number of her crew came down with the Spanish Influenza, and a number of new sailors and officers had to be taken on from other vessels to make up her normal complement of about 40. As a result, a number of the crew taking the ship to Triangle were from other vessels, some only boarding at the last minute. As the Galiano set off North of Vancouver Island, it was clear that the weather was not going to be good. In what has been described as a raging hurricane, the ship set off as the weather was reported to be 110 knot winds with 45 foot seas. In addition to supplies, the ship was bringing a new housekeeper to replace Emily Brunton, who had been working at the wireless station and had not left Triangle Island for the last 18 months. Doug Bate and Arthur Hume on the Galiano. Both men, from New Westminster, perished when the ship was lost. The Galiano managed to make it to Triangle Island, and tucked into the East anchorage while the supplies were unloaded and the passengers embarked and disembarked via tender. When the winds started to pick up the crew quickly offloaded the last of the supplies they were carrying at the bottom of the tramway system and hurried back to the ship. They departed approximately 5:00pm. One wireless operator, Syd Elliot, had been on the beach prepared to leave with the ship, but at the last minute he received new orders and stayed on the Island. The night shift was on duty in the radio room at 3:00am when the mayday call came in on the wireless from the Galiano: "Holds full of water; send help." Ironically, the ship operator who sent the message, MJ Neary, had a brother who was a wireless operator at Triangle Island, MC Neary. Originally the papers reported that he was the one who received the message, but it was later clarified that he was off-shift, sleeping at the time. The crew opted not to wake him to give him the news. Authorities at the time estimated that if the ship were travelling at 10 knots they would almost have been within sight of the light of Cape St. James, at the southern point of Haida Gwaii, when the distress call was made. All vessels within the vicinity were asked to search for the disabled vessel. The next day, in stormy seas, one body was recovered along with a skylight (15 ft by 10 ft) from the Galiano's engine room. Within the next couple of days two more bodies were found. It was believed that the ship either foundered on rocks south of Cape St. James or turned offshore to await the dawn and was overtaken when a large wave washed over the ship, flooding it. The rest of the wreck was never recovered. 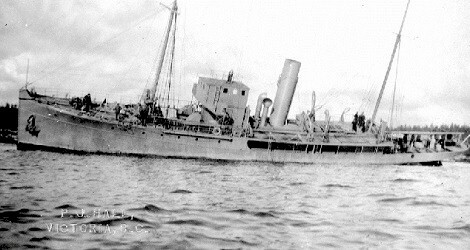 Forty lives were lost, and the Galiano became the only Canadian naval ship to sink during World War I. There is memorial to the crew in the Ross Bay cemetery in Victoria.